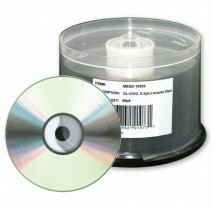 Microboards DVD+R Dual Layer media is the consumers' choice for cost-efficiencient discs with printable surfaces. Available in the sleek silver lacquer, crisp white inkjet, and smooth white Everest, all varieties are hub-printable and come sealed in 50-disc spindles. Microboards DVD+R Dual Layer media is the overall unanimous consumers' choice for cost-efficiencient discs with printable surfaces. Available in the sleek shiny silver lacquer, crisp white inkjet, and smooth white Everest, all varieties are hub-printable and come sealed in 50-disc spindles.